Yogyakarta Tour Package is complex and so much soul nourishing. People who plan the tour perfectly and use a trusted travel agent will surely experience excellent service of Yogyakarta trip. Yogyakarta is a special region in Java. It is the only one that has the royal life of Yogyakarta Sultan and preserves the majesty culture of Javanese. Yogyakarta people have a good personality and welcome to foreigners. The architecture of the city is attractive as well. Besides, Yogyakarta has many temples with breathtaking look and history. Yogyakarta Tour Package offers cultural and outdoor trip. Yogyakarta to Bali via Bromo tour will be challenging. Yogyakarta Bromo Ijen Bali tour price is low for the superb services. The journey in Yogyakarta will be more comfortable with the classes and shopping facilities that people can use. Yogyakarta is the home crafts and artworks. 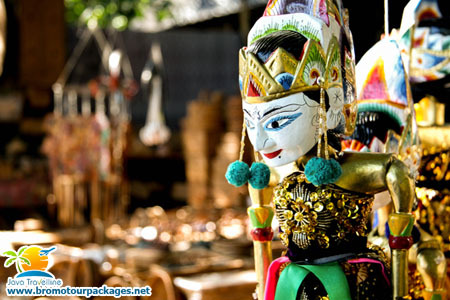 Live performance of puppet show (Wayang) and dances are available as well. Not to mention the beautiful natural landscape that tourists can visit while getting pleasure in the stunning historical temples and other sites. The classes and workshops show that the Yogyakarta Tour Package includes the educational tour as well. Basically, the tour of Yogyakarta can be divided into three types of tours. The first one is the culture and theme tours. This is the most popular tour for foreigners. They can go to Borobudur and Prambanan as the opening for this tour. The second tour is the classes and workshops. The travelers will fall in love once they enter the Batik or traditional weaving classes. They can also go to the dancing club and learn the beautiful royal dances. The third type is the outdoor tour. The lava tour is waiting for the tourists to explore. 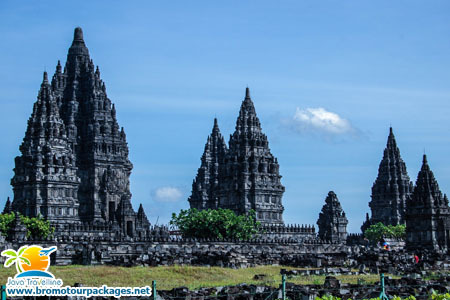 In Bali, Brorobudur and Prambanan are two main destinations that tourists should never miss in Yogyakarta Tour Package. Besides, they can go to Plaosan Temple, Pawon Temple, and Mendut Temple if cultural heritage sites are the destinations that they really want to enjoy. Besides, travelers can go to Mt Merapi Lava Tour for the amazing outdoor tour. It covers a 4 WD tour to the challenging rivers and landscape. Tourists can go visit the museum of Merapi eruption to see the ultra dangerous eruption of this active volcano. After that, tourists can value their time in Yogyakarta by visiting the Imogiri Kings Cemetery. But then, travelers who arrange a long trip in Java can take the Bromo Tour as the additional destination. Bromo is located in East Java but it will not take too long to reach the location. There are several options of transportation that travelers can take. But commonly, they will go to East Java by car. It takes approximately 10 hours to go to Probolinggo, East Java from Yogyakarta via highways of Salatiga- Kertosono or Soker. Yogyakarta Tour Package is never boring since travelers can still enjoy the beauty of Indonesia while spending some hours in the car. The high-quality car and professional drivers will make the tour convenient. Arriving at Probolinggo, tourists can take a good rest at the hotels around Bromo before leaving for the sunrise tour or complete outdoor in Semeru Bromo Tengger National Park. All itineraries on the packages are covered within one trip. Tourists can ask the travel agent to tailor the best schedule of tour in Yogyakarta. The tour can be extended to other regions such as Semarang and East Java for a more satisfying trip. Even, travelers can start Bromo and Bali tour from Yogyakarta. Bromo will be an amazing part of Yogyakarta Tour Package. However, that Bromo volcano tour should never be the closure. Travelers should never miss Ijen after Bromo outdoor trip. Ijen is located in Banyuwangi. It takes approximately 4 hours from Probolinggo to Banyuwangi. But that travel will worth the pleasurable experience that travelers dream of. 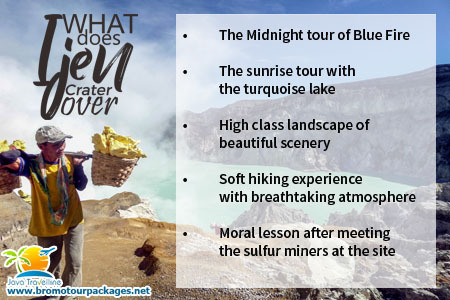 What does Ijen Crater Offer? Yogyakarta Tour Package will be a flawless trip for every heart. People can start in Yogyakarta city tour before ending the tour in Bali. We all know that Bali is always the stunning trip in Indonesia. Being the most wanted international tourist destination, Bali has various tour spots that are found nowhere else in the world. For instance, people can go to a traditional village in Trunyan or Panglipuran. The essence of Bali culture is strong in both villages. Tourists will never forget their experience in visiting Trunyan village with the unique human cemetary. In Panglipuran, people will trace back in time to see the gorgeous traditional village with the amazing houses and atmosphere. The village tour is also available in Yogyakarta Tour Package. Get Your Yogyakarta Tour Seat Now! Tourists can spend an amazing city tour in Yogykarta. After that, they will continue the pleasurable journey in Bromo. What can tourists get pleasure while in Bromo? The challenging sunrise midnight tour to the Bromo view point. Tourists will hop in the 4WD and reach the view point by climbing stairs. Sunrise in Bromo is a million dollar sunrise that people will treasure for the rest of their life. Going to one of the prettiest savana in the world around Bromo by 4WD cars. Riding horses and enjoy the serenity of green Teletubbies hills in the National Park. Culinary Tour with superb traditional cuisines. Yogyakarta Tour Package is also the one that adventurers will love. Bali is always admirable with the beaches, culture, and luxurious services. On one side, tourists will love the serene beauty of the nature in Bali and in the other side, Bali offers modern entertainments and nightlife as well. Tourists can get all of the fanciness with Yogyakarta Tour Package with Bromo and Bali extension. The beauty of Java will be wrapped up wonderfully with Bali destinations. People can treasure the moment for the rest of their life. The royal life of Yogyakarta, the majestic Bromo and Ijen, and finally Bali will never fail to give travelers sweet memories. Contact Yogyakara tour package agent and book your seat right now.